Hey all, it's been a few days since the last update, huh? Well, that's cause I was working on a monster set for your perusal! This one is a big one, folks, and feature what I dub the Koopa Korp! Yep, there's a whole bunch of minions here for you to look over, and should be enough to cover the days that have passed without this series rearing its head here on TAY. The soldiers of King Koopa's army, these Koopas have gotten a bit of a facelift - the idea was to individualize them to give a sense of personality to match their role in the army. Let's take a look at these baddies, both memorable and obscure! Shellcreeper It is thought that the Shellcreeper is the link between the turtles of the real world, where Mario is from, and the Koopas found in the "other side" where the Mushroom Kingdom lies. Be it by genetic mutation, alchemy, or scientific experiments, Shellcreepers walk on all fours and attack by sliding about in their shells and using their jaws to capture and bite prey.. They are bred and deployed by King Koopa in the undergrounds and in pipes, to ambush the heroes who use them for transportation. When deciding what style of Koopa Troopa to use, I opted to go for now staple bipedal version. By a stroke of luck during research, I found out that the original turtles seen in Super Mario Bros. were called Shellcreepers and got a chance to feature both characters with redesigns. Its design is straight forward, relying on a snapping turtle for reference. It's pretty much an HD upscale, alongside my wants to make it look like a proper adversary. The indispensable foot soldier, the Koopa Troopa is cannon fodder for Bowser's army. Of the Koopa Korp, the Koopa Troopas make up a large number of the force and outnumber the other classes by and large. They are given little to no training and are ushered out to the battlefield with cheap armor. Thrown into battle, Koopa Troopas are forced to use whatever wit and vigor they have to get by. 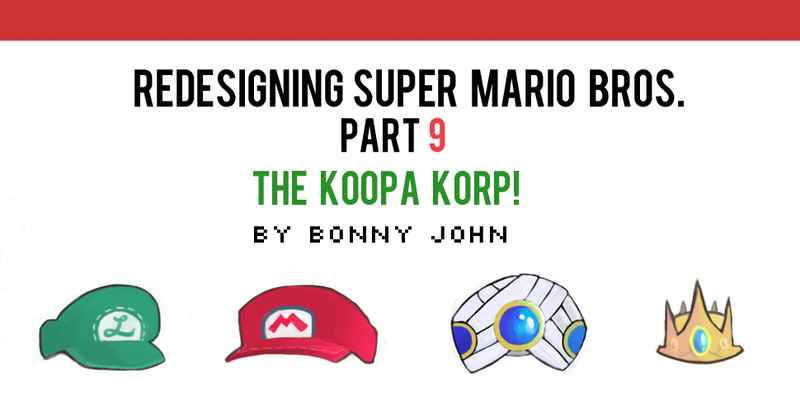 Because they are expendable, King Koopa allows the heroes to sort out these cookie cutter soldiers, and whoever survives get upgraded into appropriate classes. Koopas are treated with little to no respect, and are often the subject of ridicule by their peers. This only adds to the fuel they run on during battle, turning their mixed emotions and letting it out onto their enemies. Although a single Koopa isn't much of a threat, a group of Koopas should not be taken lightly. Are Koopas who have a knack for battle and are qualified to use booster packs for aerial assaults. A team of Koopa Troopas are usually given a commanding officer in the form of a Paratroopa who will go into battle with them. Paratroopa's with scarves are members of the army who have mastered flight with booster packs; they outrank the other Paratroops who are still in training. Paratroopas tend to be show-offs who enjoy performing acrobatic manuevers in air. It is looked down upon by others because their fuel is only refilled once every day, so their jetpacks must be used sparingly. Paratroopas are obviously used for recon missions and gather data well - their combat abilities are second to their knack for planning. Fun-fact: Their jet pack are made up of 3 shells - one main shell that conceals the gas tank and two shells that protect the boosters of the jet pack. This set up was inspired by the 3 red shells power up from Mario Kart! The skeletons of fallen Koopas are animated into a living entity as enabled by the arcane sorcery of the Magikoopas. Most of the Dry Bones animated are made up of incomplete skeletons, sometimes missing a foot or arms, and the undead minion will attack with whatever it can depending on its situation. For example, if a Dry Bones is missing its hands, it will use its mouth to bite. If it has no head, the Dry Bones will flail around with whatever limbs it has. In other situations, Dry Bones may have multiple arms or heads, and the more pieces of bone make up the creature, the more formidable it shall be. Generally speaking, Dry Bones are commanded to carry out simple tasks like walking back and forth in a set pattern, and attack whatever it sees. The efficiency of a Dry Bones depends on how much magic still rattles about in their bones. You can tell when a Dry Bones is nearly depleted of the magic that fuels it depending on how bright its life force is. This aura is seen in its eyes and swirls about the bones. The dimmer the light, the more closer to "death" it is. The Magikoopa is among the great achievements of the great wizard and advisor to King Koopa, Kamek. Magikoopas are born from the life force from the caster - they are dopplegangers that carry sentience straight from the source. As such, Magikoopas resemble Kamek, but only to a degree. Kamek, now old and frail and barely able to ride a broom, can create several Magikoopas at a time and at a cost. The more Magikoopa released into the world, the more life force is drained from Kamek. At the expense of his health, Kamek can release these forms to cause mayhem and havoc in multiple locations at one time, far from further harm to hold the magic. As they are an extension to the caster, they behave like him, talk like him, and fight like him. Even more amazing is that Kamek can swap places with any double and even see through their point of view. They are truly among the most feared forces of the Koopa Korp. Boomertroopas are small and quick on their feet - they can be a pain to deal with. Nimbly manuevering through the battlefield, Boomertroopas can coordinate impressive attacks with other Boomertroopas. They may get into formation where Boomertroopas attack in unreadable patterns, throwing and catching eachother's boomerangs and trapping their foes. Boomertroopas are cocky, love the thrill of battle, and are eager to fight. As such, they are seen throwing their boomerangs out of boredom while waiting for their enemies - as practice and to stay nimble- well before their enemies get in range. Boomertroopas hold onto their boomerangs till the day they fall. They customize the boomerangs to individualize themselves, and can identify others with a simple glance of their boomerangs. Hammertroopas are stoic individuals who are almost entirely the opposite of the Boomertroopa. They are slow and less coordinated - they usually operate alone, and work with maybe one other Hammer bro at most. Of this first squad of the Koopa Korp., the Hammertroopas are considered the clean up crew. They can take hits and dish them out too - they are adept at using their hammers for melee attacks and as projectiles. If an enemy attempts to escape, Hammertroopas can snipe targets with impressive range. Hammertroopas are given one area to station in at a time. They carry a large number of hammers into their marked location and will use them without any care of running out. Once the area is cleared of enemies, they will force the surviving Koopa Troopas to collect their hammers for them, and carry them to the next area they station in. Chargin Chuck is the ideal Koopa soldier. They can hit hard, take hits, and are quite agile - these 3 aspects give them great dexterity. As such, they are disciplined in various sports in which they use those skills and incorporate into their combat. Chucks are known to get quite competitive, and enjoy the spirit of battle. A number of Chucks will not continue a match if their opponent is not up to snuff - it does not enjoy a win if it was not earned on equal footing. A few of the Chucks on the other hand are quite ruthless, and a scandal has emerged regarding substance enhancement abuse, that King Koopa unsurprisingly does not care about. Chargin' Chucks wear a custom jersey fighting for their "team". That said, they all have their own numbers, and King Koopa has given certain "players" a place in the hall of fame, which inspire younger Chucks to aim for. Great caution should be taken when a team of Chucks come across your way. You might get hit with golf clubs, baseballs, a flaming soccerball, a dizzying spiral pass of a football, cricket bat, hockey puck, and more. The Sumos are the heaviest of all Koopas and make for great defensive walls against opposing armies. It takes a team of several Chargin' Chucks to even move the Sumo a few inches. These Sumo Troopas can cause mini tremors with a stomp of their feet, much like the Boom Boom does with their arms. Getting up close and physical is not advised - they are surprisingly quick and have effective grappling techniques that can make short work of any unsuspecting foe. Of the Koopa Korp, the Sumotroopas are rather limited in number- not many Koopas have the will - or stomach - to become a Sumo. The day they reach the title of a Sumo troopa, they have tattoos emblazoned on their arms as way of celebrating their pride and achievement. It is but one way they identify one another...The other by counting their stomach rolls. Are just as rare as Sumos. They are outfitted with special capes that give them flight and augmented speed and strength. Although they are small, they are the best fit for the cape and are among the most intelligent of the Koopa Korp. Super Koopas present a rare and powerful opportunity for Mario and the gang. Because Super Koopas use a dive-bomb attack, the heroes can bide their time and steal their capes off their foes and gain the same powers the Super Koopas once had. Super Koopas fight for justice... which from their point of view is opposing the regime of the Toadstool royalty and the Mushroom Kingdom that has pushed the Koopas into the underground. The social inequality they strive against fuels their passion to fight, and so they don the cape to assist as leaders in the community to recruit soldiers as a the voice of propaganda. Having a hero to look up to, young Koopas join and look forward to the day to be led into battle by a Super Koopa flying high above the clouds. Are the silent but deadly type...Except the silent refers to the fact that he doesn't speak much, and that his crashing fists sound like a busy construction yard! His arms operating like bulldozers; this incarnation of Boom Boom can barely lift his giant arms from off the ground. Thus, he leaves them down and runs into anything that gets in the way of his fists. When he build up enough strength to raise his fists above his head, our heroes better be careful - they can cause tremors much like the Sumos. In fact, they can easily throw aside a sumo with their running tackles. Always ready to brawl - Boom Boom is always look for an excuse to throw down. Spikes exist on their own plane in the Koopa Korp. Not only are they the biggest, and baddest, but they are nearly unstoppable when they enter a state of rage. They are berzerkers who are reserved until needed as a last resort. Surrounding Koopa comrades get out of the way of Spikes, be it if in their normal or frenzy states. Spikes are the result of magical experimentation gone horribly wrong. They are an amalgamation of various features found in different species of Koopa. Their primary weapons are morning stars, swinging them around with ease, without any care of who they hit, including their own army. They can breathe fire, possess great strength, have a tough hide for defense, and can reach high speeds when running. As one would imagine, they aren't the brightest of beasts, preferring to destroy anything in its path to solve their problems. When something comes across its path that angers it, it will immediately with little notice transform into a frenzy state, glowing a nuclear green color. It gets even stronger than before, and uses even less thought to deliver dangerous and deadly blows to whatever is in its vicinity. King Koopa is cruel...But how does he justify sending baby Koopas into battle!? It is only under the crazy circumstance that Spikes have only a few peculiar remedies to break them out of their frenzied states. One such remedy is showing them the tiny and adorable Junior Troopas. These Troopas are of a rare breed - the same kinds of species as King Koopa. In the hands of a Spike, they can grow safely under its protection but also pick up from the violent and dangerous nature of Spikes - making the Spike a sort of mentor and father figure to the children. Because Junior Troopas are treated with such care and concern, they develop nasty personalities, believing they are high and mighty. They treat other Koopas with little respect, and the only comrades they truly care for are Spikes. Whew! And there you have it! Hopefully today's set makes up for the fact that I've been missing a few days. Keep your eyes peeled for the next set - the sub bosses! Hope you enjoyed the art and the write up. Your critiques and comments are welcome and encouraged. Thanks for looking!